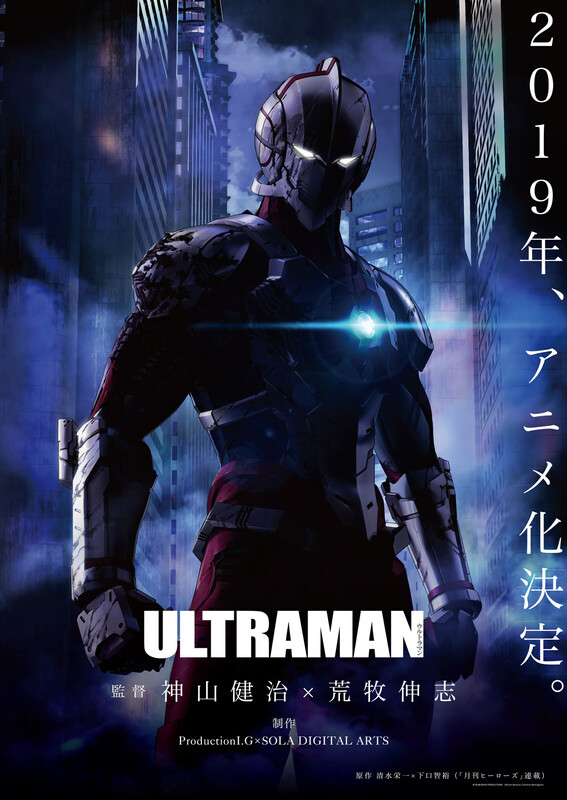 The Ultraman manga comes to the big screen in 2019 as a 3DCG anime film. Image courtesy of Tsuburaya Productions. Promotional artwork for the ULTRAMAN anime film. The legendary hero Ultraman is going to be reborn as a new hero. Fields Corporation (Head office: Shibuya-ku, Tokyo; President and COO: Tetsuya Shigematsu) and Tsuburaya Productions Co., Ltd. (Head office: Shibuya-ku, Tokyo; President and COO: Takayuki Tsukagoshi) have announced the popular manga Ultraman (ウルトラマン, Urutoraman) will be made into a 3DCG animated feature film. The movie is to be directed by Kenji Kamiyama (GHOST IN THE SHELL: S.A.C., 009 RE:CYBORG) and Shinji Aramaki (APPLESEED, HARLOCK: SPACE PIRATE), and produced by Production I.G (GHOST IN THE SHELL) and Sola Digital Arts (STARSHIP TROOPERS: INVASION). 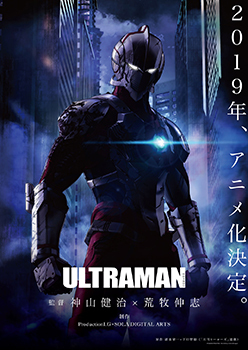 ULTRAMAN is scheduled for theatrical release in Japan in 2019. Created by Eiichi Shimizu and Tomohiro Shimoguchi, the Ultraman manga debuted in the monthly magazine Hero’s in 2011. By playing with the traditional image of Ultraman, the manga quickly caught on with young readers, exceeding 2.6 million copies sold in Japan. The English language edition is available in North America from VIZ Media. The story is set decades after the events of the original ULTRAMAN television series, in which a giant alien being joined Shin Hayata of the Scientific Special Search Party to save Earth from terrifying monsters. Now, Shin’s teenage son Shinjiro has learned that his father passed on the “Ultraman Factor” to him, and that he possesses incredible powers. Wearing a metallic Ultraman suit, Shinjiro has become a new, human-sized incarnation of the famous hero. More than half a century after the broadcast premiere of the first ULTRAMAN, the hero will be taking a big step to a new level. Tsuburaya Pro has promised regular updates on the project’s Official Twitter account and in the pages of Hero’s (on sale the first of every month in Japan). Kenji Kamiyama was born in Saitama Prefecture on March 20, 1966. He worked as an animation director on JIN-ROH: THE WOLF BRIGADE (人狼, Jinroo, 1999) and wrote the script for BLOOD: THE LAST VAMPIRE (2000), then debuted as director with MINIPATO (ミニパト, 2002). International attention arrived with the TV series GHOST IN THE SHELL: STAND ALONE COMPLEX (攻殻機動隊 Stand Alone Complex, Kookaku Kidootai Sutando Aroon Conpurekkusu, 2002) and its second season, GHOST IN THE SHELL: S.A.C. 2ND GIG (2004), followed by the feature-length GHOST IN THE SHELL: S.A.C. – SOLID STATE SOCIETY (攻殻機動隊 STAND ALONE COMPLEX Solid State Society, Kookaku Kidootai STAND ALONE COMPLEX Solid State Society, 2006). In 2007, after almost 6 years spent in the world of GHOST IN THE SHELL, Kamiyama directed the high-fantasy TV series MORIBITO: GUARDIAN OF THE SPIRIT (精霊の守り人, Seirei no Moribito) followed in 2009 by EDEN OF THE EAST (東のエデン, Higashi no Eden). His recent credits include the feature films 009 RE:CYBORG (ゼロゼロナイン リ・サイボーグ, Zero-Zero-Nine Re: Cyborg, 2009) and NAPPING PRINCESS (ひるね姫 〜知らないワタシの物語〜, Hirune Hime 〜Shiranai Watashi no Monogatari〜, 2017). Born in 1960 in Fukuoka Prefecture, Shinji Aramaki is a highly-regarded producer and designer who has been involved in works such as GENESIS CLIMBER MOSPEADA (機甲創世記モスピーダ, Kikoo Sooseiki Mosupiida, 1983), MEGAZONE 23 (メガゾーン23 Megazoon Tsuu Surii, 1985-91), GASARAKI (ガサラキ, 1998) and MOBILE SUIT GUNDAM MS IGLOO (機動戦士ガンダム MSイグルー, Kidoo Senshi Gandamu Emuesu Iguruu, 2004-06). In 2004 he directed the 3D CGI 3D film APPLESEED (アップルシード, Appurushiido), and later helmed its sequels APPLESEED EX MACHINA (アップルシード エクスマキナ, Appurushiido Ekusu Makina, 2007) and APPLESEED ALPHA (アップルシード Alpha, Appurushiido Alpha, 2014). He also directed the CG films STARSHIP TROOPERS: INVASION (スターシップ・トゥルーパーズ　インベイジョン, Sutaashippu Toouruupaazu Inbeijon, 2012), HARLOCK: SPACE PIRATE (キャプテンハーロック, Kyaputen Haarokku, 2013) and STARSHIP TROOPERS: TRAITOR OF MARS (2017). Production: Production I.G, Inc. and Sola Digital Arts, Inc.
Toward the realization of their corporate philosophy, “the greatest leisure for all people”, Fields Corporation’s business model is centered on IP (Intellectual Property). The company focuses on creating, circulating and utilizing IP in the field of comics, animation, movies/television, and even pachinko/pachislot games to a wide range of merchandising.